Sciencekoekje: How to: My defrosting routine. Yes it has finally become really really cold in this country i call home. 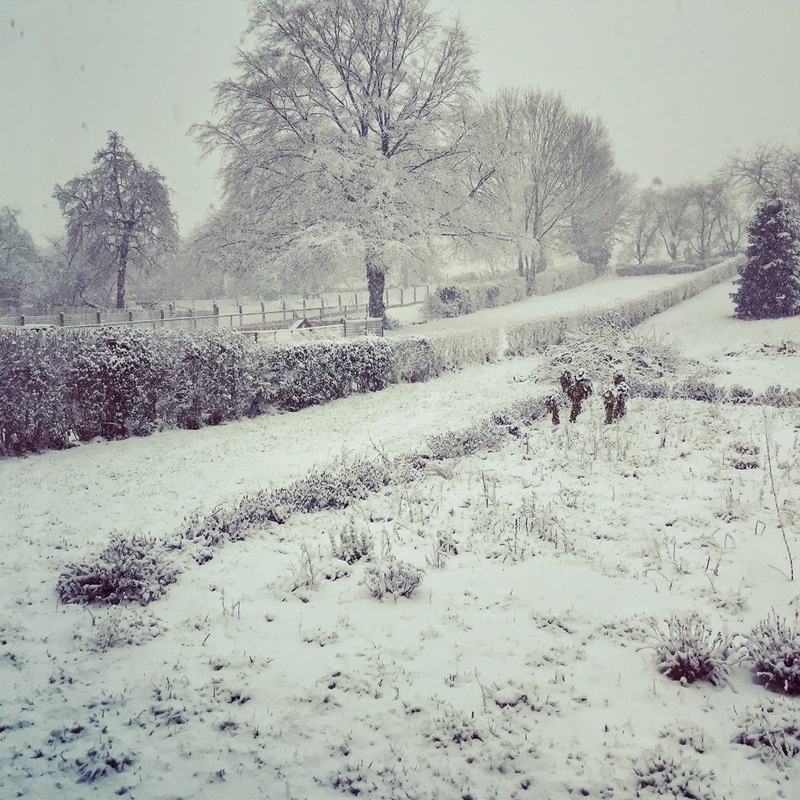 I love snow and i love the cold. That is either during a winter walk or from the inside of my comfy cosy house. In the morning on my way to work? Not so much! So well when i come home in the evening, frozen to the core after the commute, i need a routine to defrost my insides because unfortunately the cold has bothered me anyway (frozen reference anyone?). So here is my guide to: How to survive the cold. First thing i do when i come home and i have the feeling i have icicles for legs and i will never ever know again what warmth is, i take a long hot shower. Obviously a bath is also amazing but sometimes i do favour just the hot steaming shower. Obviously what i need under there is a warm and comforting shower gel an obviously, there is where my latest obsession comes into play. 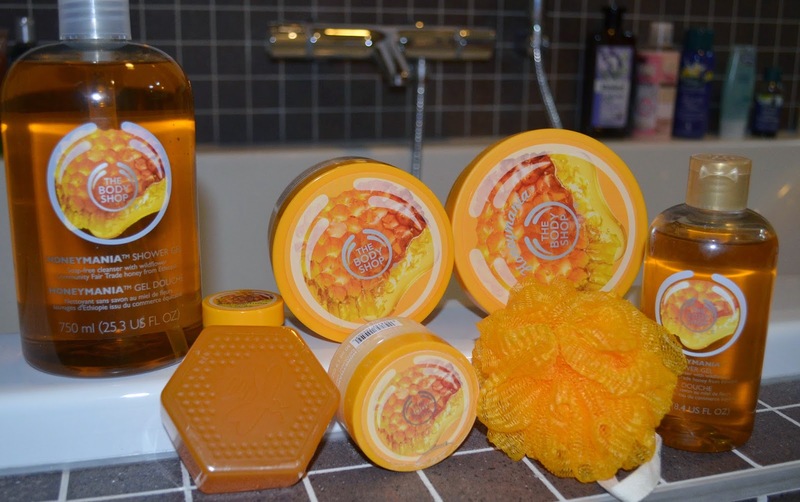 The Honeymanyia series by the Bodyshop. The honey smell is like a warm hug. After leaving the shower (the only thing i hate about a shower, leaving it again). The upside to a shower, you can also take your make up off under it. Actually i will rub my face in with the bodyshop camomile faceoil and then wash it off in the shower. Two things done in one. Awesome if you are tired and frozen. After the shower i will slather on some bodybutter and get into my most comfy PJ and most importantly, cuddly, comfy socks. Preferably after putting on some good foot lotion. 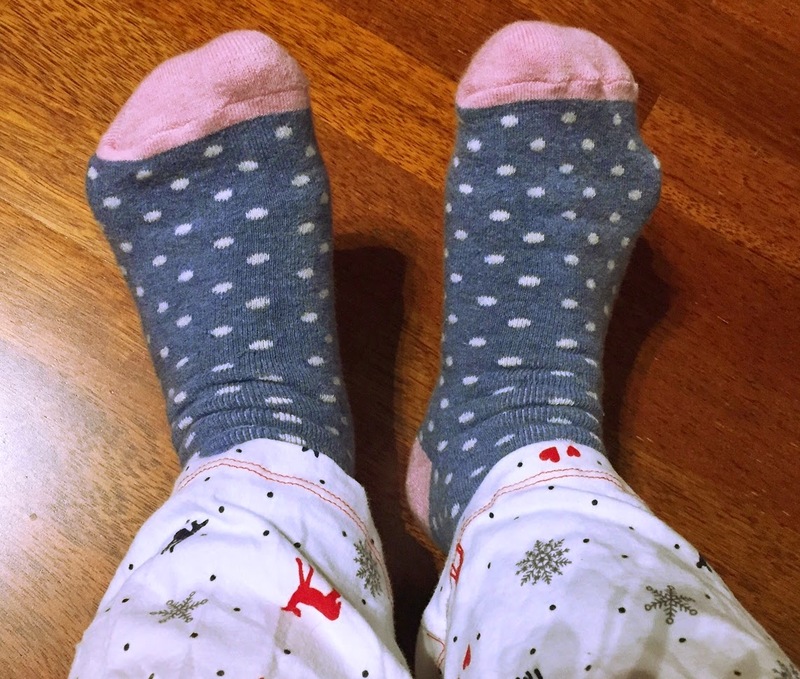 This socks are from Primark and for only 2,50 EUR, they are keeping my feet all comfy and cozy for the evening and night. The next thing on the list is dinner. 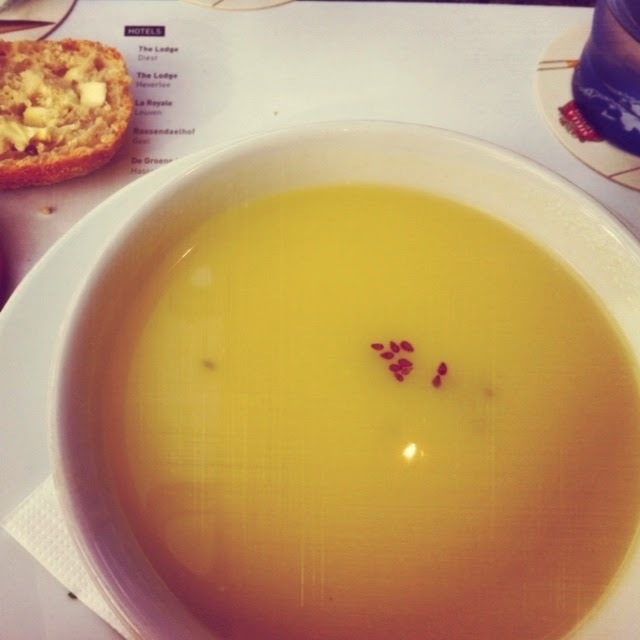 Now beeing cold makes me extra tired and often i do not feel like having a big dinner so my favourite is a hot soup and/or a cheese toast. 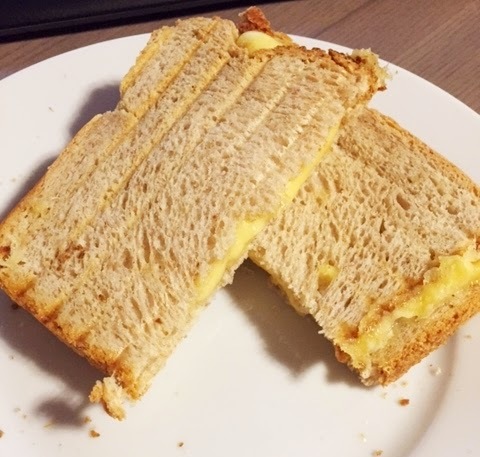 I know, i know, the second one is not beauty blogger aetherial healthiness but it tastes awesome, it warms me up and besides cheese always loves me back so get off my case. Okay now that i am fed, i will usually go and spend some time at my PC and obviously in the company of some warming drink. Now there are two options. Obviously my trusted cup of tea and i have some teas i love especially in the evening when its cold outside. 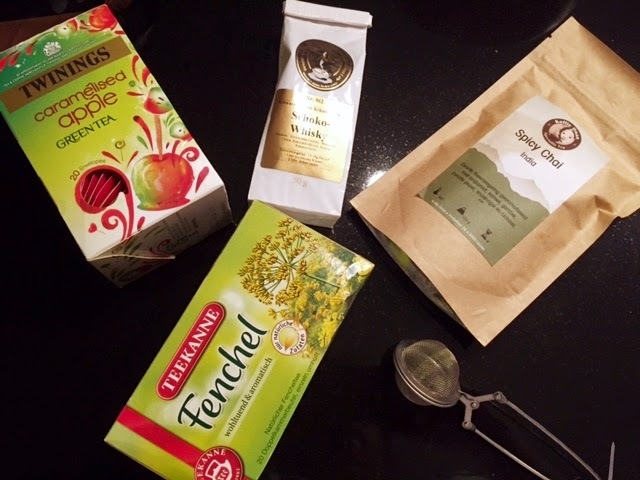 So on the picture below you can see some of the teas i am loving right now: The twinning caramalized apple tea is to die for. There was a while ago a Lipton hot apple tea which i loved but obviously Twining takes it up a notch. This is however, green tea so better to not drink to much when you are planning an early night. Then i have a Schoko Whiskey tea which i bought in Aachen. It actually contains real chocolate and tastes deliciously indulgent. Then i have a spiced chai which i bought in Leuven which is an alltime favourite and last but not least my trusted Fennel drink. You have stomache or throat pain or cannot sleep? Drink fennel tea. I just love the natural liquorice flavour and it is so wonderfully calming. My second option is obviously a hot chocolate. Since i am lactose intolerant, i am buying the Alpro Soya almond dark chocolate drink. However, since then my family and my husband have been starting to drink this too. 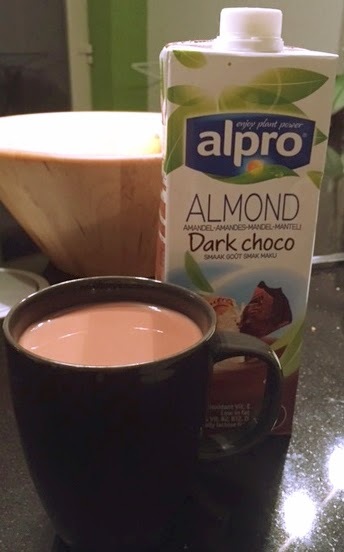 Not only does the almond in the milk go perfectly well with the chocolate, this drink is even less calories while beeing super creamy and richt tasting, so even if you are one of the lucky dairy processers, i can only recommend this. 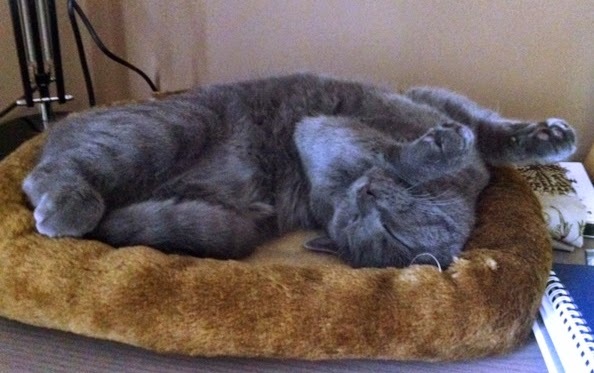 And now that i am all warmed up, fed and comfy, the only thing left is to cuddle myself in at a comfy place and relax. What is your defrosting routine? Let me know in the comments. Ye and he is very aware of it ;). Thx for commenting.